Over the past couple of years, the 40-Minute Bible Study series has been a major focus for multiplication. When we spoke to leaders across Canada, many of them found it very difficult to grow their Precept Upon Precept Bible Study classes because there didn’t seem to be a hunger or desire to study God’s Word. We took this information and developed the Cross-Canada Tour, which introduced 40-Minute Bible Study leader training with results that were far beyond what we would have ever asked or imagined. Since 2013, we’ve seen more than 2000 people trained, and on average 200 new classes started every year. Praise the Lord for this growth! We believe one of the keys to this growth is the confidence that the individual attending this training gains. When we receive evaluations back, most participants indicate that the practical hands-on experience they got in leading the 40-minute studies has given them a confidence to go out and start classes. This is the kind of confidence we’re not seeing through our other leader training: the Precept Upon Precept Leader training. For years in partnership with the US, we’ve tried diverse ways to develop good leaders through our 2-day How to Lead Precept Upon Precept leader training. But we found that many of the people attending the training did not leave with the confidence to lead a Precept Upon Precept (PUP) class. This must change, because we know that our Precept Upon Precept Bible studies are the best studies to take students deeper into God’s Word. We’re still seeing several new Precept Upon Precept classes starting, but many of those classes start because our current PUP leaders are raising up individuals in their classes and then sending them to the training. In some cases, the leaders who are coming to us at Precept are already well trained by their leaders, and the training becomes more of a formality or a rubber stamp. These cases are small in comparison to the thousands we’ve trained over the years who’ve never taken on a leadership role, and yet we classified them as leaders. Paul wrote to Timothy, “The things you have heard from me in the presence of many witnesses, entrust these to faithful men who will be able to teach others also” (2 Timothy 2:2). In my Bible, underneath Matthew 28:18-20, I’ve written “it’s not about the quantity of disciples but the quality of the disciples we make.” I think that’s what Paul is saying to Timothy as well: Timothy, take the words which I was given, that I gave to you, and entrust those words to faithful men who will entrust them to others. This is the multiplication process we’re seeing with the 40-Minute Bible study training. In this training, students get to practice leading and they’re coached by the trainers to be effective in leading the discussion—and the result is new classes. In comparison, the Precept Upon Precept Leader training required the leader-in-training to watch the trainer lead two PUP lessons, then learn the leader guide, and then go off to lead a class. What we’ve realized is that this is not entrusting to the faithful. In some cases after the training, leaders have strayed from the original intentions of the Precept Upon Precept method and material by lecturing, adding multiple secondary resources, and have drawn students away from reasoning through the Scriptures together. These leadership models make it virtually impossible for a group leader to see multiplication in their group, because students look at the leaders, think about the time commitment to get the class ready, and think they will never be able to match what their leader is doing. When this happens, we miss the “entrust to faithful men who will entrust to others”. We would eventually be seeing a decline in the number of Precept Upon Precept studies started across Canada. But thankfully we are not there yet. This is where our new Precept Upon Precept leader training comes in. 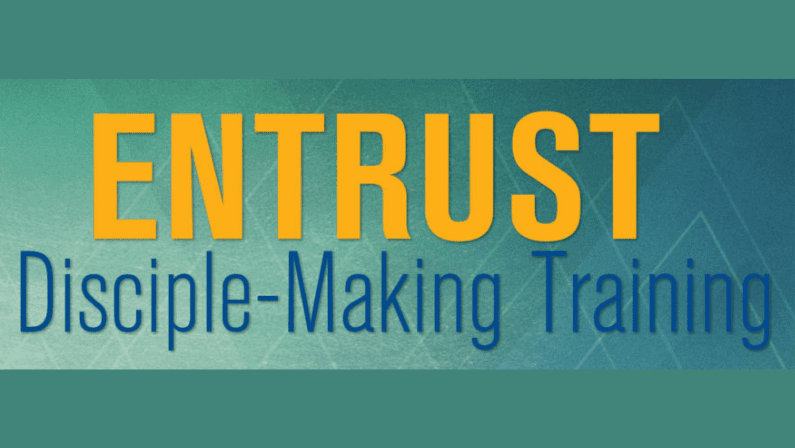 We have developed the Entrust Discipleship Program, and in June we’ll have our first group of Entrust students come to Brantford and be trained to disciple and multiply Precept Upon Precept leaders within their groups. In the meantime, we’ve stopped running our 2-Day Precept Upon Precept Leader Training as we do not believe that this training is an effective way of raising up new leaders who will raise up new leaders. We want to see the same growth we’re seeing with our other studies. And that means we want to create an environment where new potential leaders can be mentored and coached as they practice leading under the guidance of our Entrust coaches. We know this process will take longer, but we’re ok with that because it’s about quality, not quantity. We have many more exciting changes in training that will be announced soon. msheldrake@preceptministries.ca and I would be happy to share more with you.